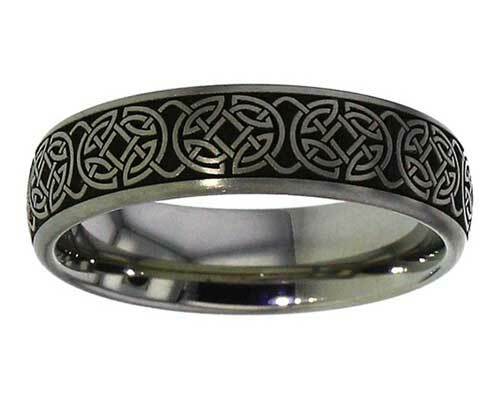 Celtic Shield Knot Titanium Ring : LOVE2HAVE in the UK! A domed profile Celtic ring made from titanium that features a deeply recessed engraving against the natural grey colour of titanium. The repeated continuous pattern is that of an interlaced circle and a square that goes all the way around the ring. The Celts used circles in many of their designs, and the symbolism is profoundly significant. These types of Celtic patterns are known as shield knots in that they were thought to offer protection from evil spirits and therefore painted onto their battle shields. Circles represent harmony too that allow life to exist as it is, for example, the repeating cycle of the seasons. The ring measures 7mm in width, and we have it pictured here in a matte finish, but polished is also available too. The designer has advised us that the engraving for this ring takes an hour to complete. The engraved surface itself is quite textured, therefore adding to the ancient Celtic symbolism depicted.